Fall just makes me want to eat pumpkin. Unfortunately, many delicious pumpkin things (pie, bread, cookies, muffins, donuts, ice cream -- the list goes ON and ON) are sugary, fattening, calorie filled guilt on a plate. Well -- great news! I have figured out a guilt free way to have all of that pumpkin-y spice-y goodness without all of the fat and calories. 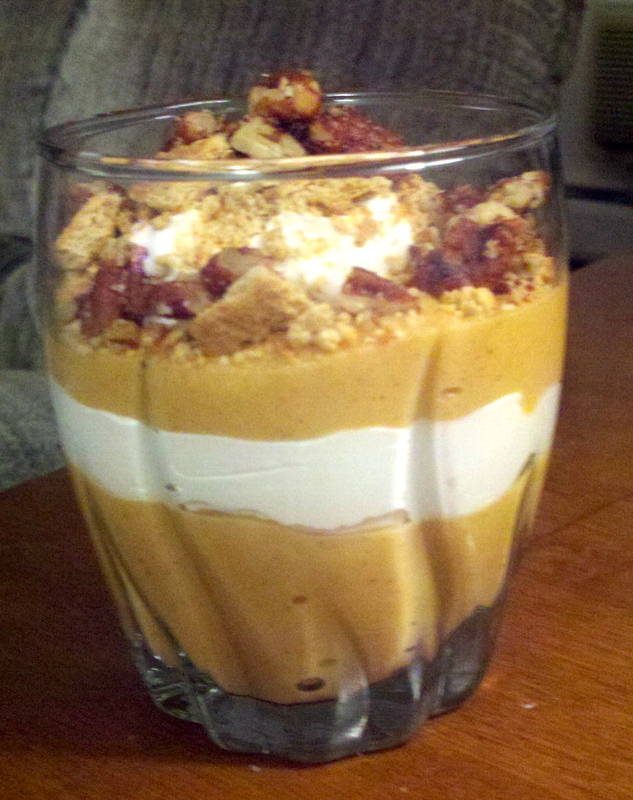 Pumpkin Pudding Parfaits! If you make this into little parfaits, they are so darn cute -- but let's be honest, it tastes just as good if you throw it all into a little bowl and call it a day. Enjoy! Prepare pudding according to package directions. Be sure to whisk for the full two minutes as the box instructs to ensure creamy texture. Whisk in pumpkin puree, pumpkin pie spice, and cinnamon. Allow to set up in the refrigerator for at least 5 minutes (longer is better). In 4 small glasses (I used juice glasses), spoon in about 1/3 cup of pumpkin pudding, spreading with a spoon to create an even layer. Next, add a layer of cool whip, followed by the last layer of pumpkin pudding. Top with a dollop of cool whip and sprinkle with crushed graham crackers and pecans. Enjoy immediately while graham crackers are still crunchy.